Due to our licensed technology and testing protocol, most of our clients significantly improve after one or two treatments, and we have the testimonials to backup this statement. Our therapy works for all ages and levels. Choose from the following categories below to see clients healed from pain. Corexcell has developed its own proprietary testing methodology to pinpoint weaknesses. The testing is based on 12 stabilizers muscles in the body. four in the hips, four in the shoulders, and four in the trunk/core region. If one of these 12 stabilizer muscles are weak, injuries will occur as a result. We then strengthen the weaknesses affecting the injury, which will eliminate the pain allowing the injury to heal. Once the weaknesses our pinpointed we perform targeted strengthening exercises while running an electrical current through the imbalance to strengthen the weakness at a faster rate. Normal stim machines rarely get results. The phoenix wave is a safer more effective technology. What usually takes 2-3 months to get clients out of pain, can now be done in 2-3 sessions. Clients love the instantaneous relief of long-term pain. We are the only company in the Lehigh Valley licensed to sell, train, and use the machine. Corexcell is ready to help you train – whether you’re injured, trying to get out of pain, or looking to reach your full fitness potential. Schedule your session today by calling, emailing, or filling out the form. We look forward to hearing from you!! 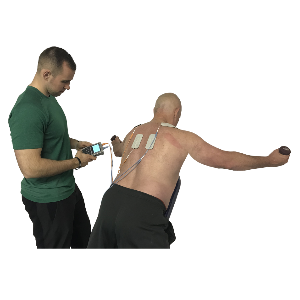 If you’re a trainer or therapist looking to get certified in our system….